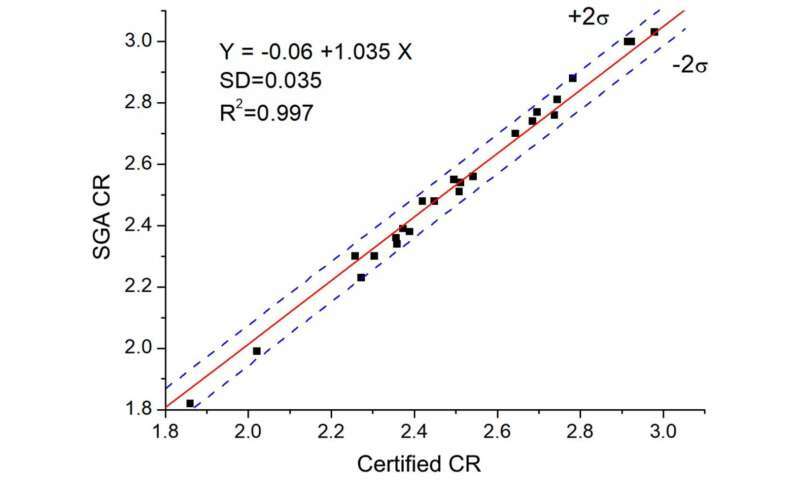 A team from Siberian Federal University (SFU) has suggested a new method for automatic composition analysis of electrolyte samples from electrolysis baths. It will provide for more accurate technological control and increase the efficiency of aluminium production. The article has been published in Crystals. Metal aluminium is obtained in the course of electrolysis, in which current is passed through an alumina-cryolite melt at around 950°. The main component of a melt is cryolite (a salt containing sodium, aluminium, and fluorine atoms) to which aluminium oxide (alumina) is added. To improve the technological properties of the electrolyte, aluminium fluoride, calcium fluoride, and sometimes magnesium and potassium fluoride can be added. In the course of electrolysis, the composition of the substance in the baths changes, and the ratio of components shifts, as well. Preservation of optimal bath composition is a key element of electrolysis technology. To maintain the optimal composition, technicians constantly take and analyze electrolyte samples. The analysis requires high accuracy and rapidness. An express control method used in the industry is X-ray diffraction quantitative phase analysis. It is based on studying X-ray images formed by the X-rays reflected from samples. In its traditional variant, such analysis has one considerable disadvantage: It requires regular calibration using control materials with accurately determined phase compositions, and it also fails to take the actual crystal structure of the phases into account. An alternative option is called the Rietveld method. It provides for quantitative analysis on the basis of specifying the atomic and crystal structure of component phases without using control samples. However, this method is interactive and difficult to automate, as it requires manually setting up to 100 initial system parameters and managing the order of their programmed adjustment. A team from SFU modernized the Rietveld method to make it applicable for automated analysis. To do so, they developed a self-configuring evolutionary genetic algorithm that uses the principle of biological natural selection to find optimal parameter values when modeling an X-ray image. First, a genetic algorithm uses random values, then optimizes the vast range of X-ray image and phase crystal structure parameters, managing the adjustment of only the best of them using the Rietveld method. Therefore, the algorithm is able to adapt and work without human involvement. "Generally, our results meet the technological criteria for the accuracy of electrolyte analysis that are used at aluminium production facilities. We can recommend our genetic algorithm to express control of electrolyte composition. The analysis shows a minor system error caused by over-estimation of cryolite concentration due to its uneven crystallization in the course of sampling. Before this method is implemented by the industry, we have to eliminate this error and also to improve the efficiency of the method," says Igor Yakimov, the head of the project, Ph.D. in physics and mathematics, and professor of the Institute of Non-Ferrous Metals and Material Studies of SFU.